Oslo's Bislett stadium is a venerable venue. It was built in 1922, although it has been rebuilt since, and a total of 23 (!) world records have been set there. But the best part about this world-class track and field arena is that, most days, it is accessible to the people of Oslo free of charge. The outdoor track at Bislett is your standard 400 m oval of red with eight lanes demarcated with white stripes. But inside the stadium, below the bleachers, is the indoor track, a veritable gift to runners when a blanket of snow covers Oslo. The indoor track has the far less orthodox length, exactly 546 m. It is round rather than oval, and so gives the illusion of never ending. There are only two lanes: the fast lane, and the slow lane. By my latest estimate, I have run 194 laps inside Bislett stadium so far this year. And yes, that is more than 100 km. My watch is an objective observer, informing me of the hard facts of distance and time. 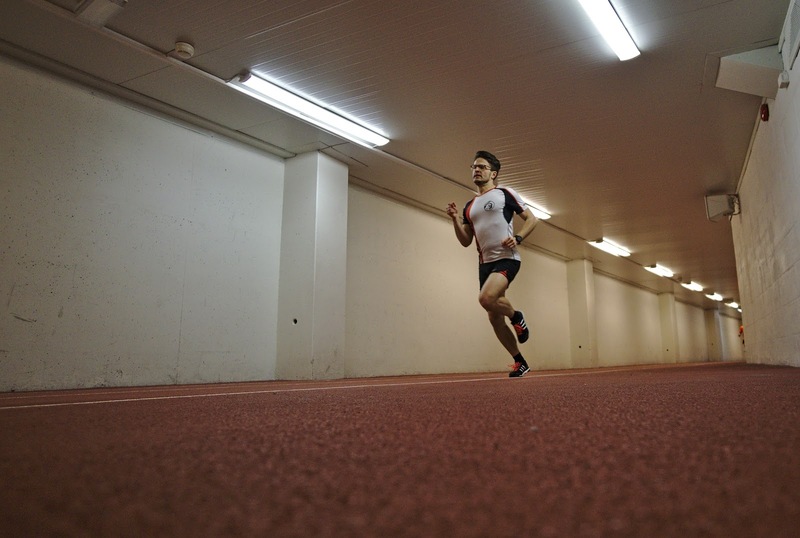 But the length of a single lap on the indoor track transcends space and time. During short intervals, the time between 50 m lines seems to span an eternity. During long intervals, a laps passes in the blink of an eye. Two years ago during Oslo Ecotrail, I ran for a while with a woman who competes at 24 hour events. One of these takes place inside at Bislett. "What do you even think about for that long?" I remember asking, wondering how on Earth someone could run around on an indoor track for 24 hours without dying of boredom. I often claim that I run to see beautiful places, to be outside and connect with nature. But somehow I find myself running in laps on an indoor track, watching a white line on a red background whiz by. And do you know what? I don't really mind. I read a piece recently (which I can't for the life of me find) that suggested that rather than running to fill our lives, we run to create a void. I couldn't agree more. Most of the time, I am bombarded with my own thoughts like a dump truck of ping-pong balls being emptied in a parking lot. What a relief it is when my consciousness is reduced to the awareness of my breath and the occasional protestation of my muscles. Round and round and round we go. The circular tunnel, initially monotonous, sprouts details. You look forward to the blast of cool air from the ventilation point. Casually observe the sprinters training in the sprint alcove. Pass one runner, another passes you, everyone moving in their own little bubble. Check the watch at the halfway point, speed up or slow down depending on the split. Just keep moving, run like the wind, imagine if you could keep going forever? 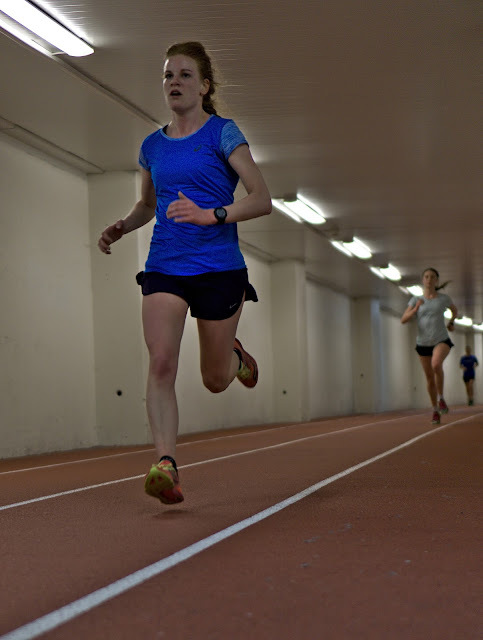 I still don't think I'm ready to run around Bislett for 24 hours straight though. Molly, this is really beautifully written, so concise and wonderful! Nicely done!